Antibacterial clays in nature include a variety of clay mineral assemblages that are capable of killing certain human pathogens. Although clays have been used for medicinal applications historically, only in the last decade have analytical methods and instrumentation been developed that allow researchers to evaluate the antibacterial mechanisms of various clays applied medicinally. Comparisons of the mineralogical and chemical compositions of natural clays that kill bacteria have promoted a better understanding of the mineral properties that are toxic to a broad-spectrum of human pathogens, including bacteria that have developed resistance to antibiotics. Popular literature is filled with reports of ‘healing’ clays, that, when tested against pathogens in vitro and compared to controls, do not appear to have bactericidal properties. It is important, however, to differentiate what properties make a clay ‘healing,’ versus what makes a clay ‘antibacterial.’ Most antibacterial clays identified to date buffer pH conditions of a hydrated clay outside the range of conditions in which human pathogens thrive (circum-neutral pH) and require oxidation reactions to occur. It is the change in oxidation state and pH imposed by the hydrated clay, applied topically, that leads to a chemical attack of the bacteria. Healing clays, on the other hand, may not kill bacteria but have soothing effects that are palliative. 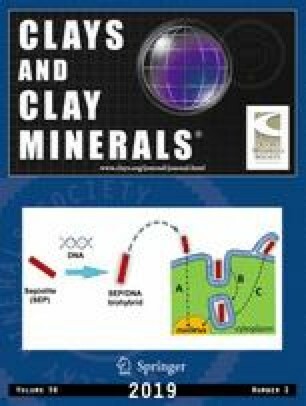 This article reviews some of the historical uses of clays in medicine but focuses primarily on the common characteristics of natural antibacterial clays and early studies of their antibacterial mechanisms. In this era of bacterial resistance to antibiotics, mimicking the antibacterial mechanisms exhibited by natural clays could be advantageous in the development of new antimicrobial agents. This research has been supported by the US National Institutes of Health (NIH R21 AT003618), National Science Foundation research grants (NSF EAR-1123931 and NSF EAR-1719325), and the ASU SIMS Facility, which is supported by NSF grant EAR 1352996. Many colleagues and students contributed to the results presented in this review and their contributions are greatly appreciated.